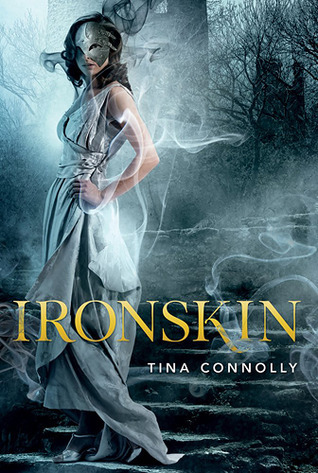 With its gothic tone and lush feel, Ironskin had me wrapped up in the story by the 50-page mark. The novel merges and reworks two classics: Jane Eyre and Beauty and the Beast. There’s no question the base of the story is inspired by the Bronte work. In Tina Connolly’s version, Jane is scarred from the fae war. While her sister is able to seek a husband to care for her, Jane must work. She takes on a governess role under the employment of a reclusive and charming man. His daughter Dorie has fae skills—the kind that have scared off many of the staff—and he needs Jane to help the girl learn to do things the human way. In the Beauty and the Beast element of the novel, both Jane and her Mr. Rochart are cursed, though in different ways. Not only is Jane’s face marked in a way that would scare of suitors, but within the injured flesh lies a fae curse. Rochart’s limitations are slowly revealed and part of the real enjoyment of this book comes in the last third when Jane begins to know him better and things switch from longing for an ideal into something tangible. One of the quotes on the dustjacket suggests Ironskin is a steampunk tale. I don’t buy that. While heroine Jane uses bits of iron to block her fae curse from affecting those around her, it’s not exactly a cogs-and-steam element. Not to say those are the only defining traits of steampunk, but more that avid steampunk fans will not find it on a grand scale here. That said, who wouldn’t want to read Jane Eyre meets Beauty and the Beast with wicked fae?